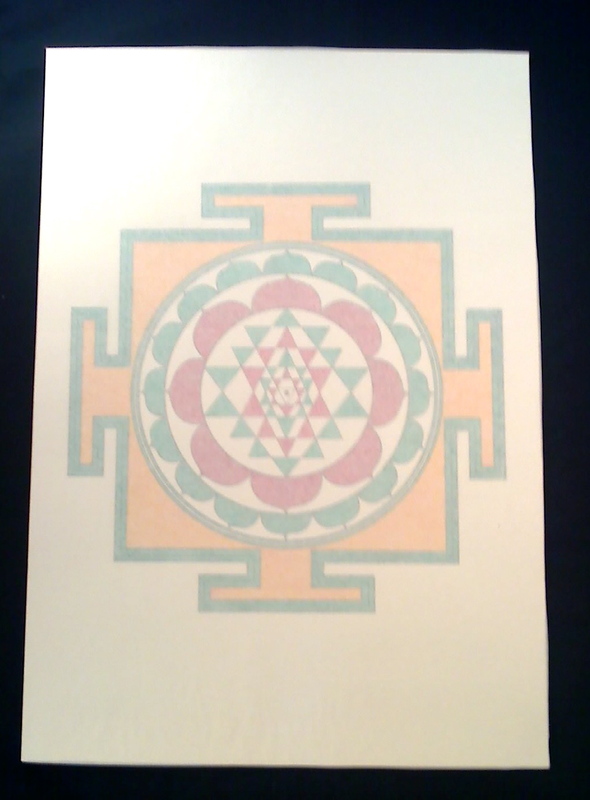 Sri Yantra #16 is a blue twin sister of previously described item. It has a bit greater diameter, 4 1/4’’, and with mathematically exact straight lines it adds beauty to this kind of art. The outermost 14-pointed star polygon is drawn inside of thin and contrast thick circles. The outside diameter of Mekhala has four lines and they form two green strip and one white (in centre). Defence square contains four gates, three black lines contour and full green edge. The mathematical exactness of the whole collection (including this one) gives a tool for those who practice such kind of meditation. It is highly organised piece of paper and lines, it’s a symbol of very, sometimes extremely difficult laws of nature human can never understand, and simple beauty surrounding us in a drop of rain, leaves on the trees or anything else — in the same time. All kind of imagination is inside the chakras. That is. The problem is how to get it out. 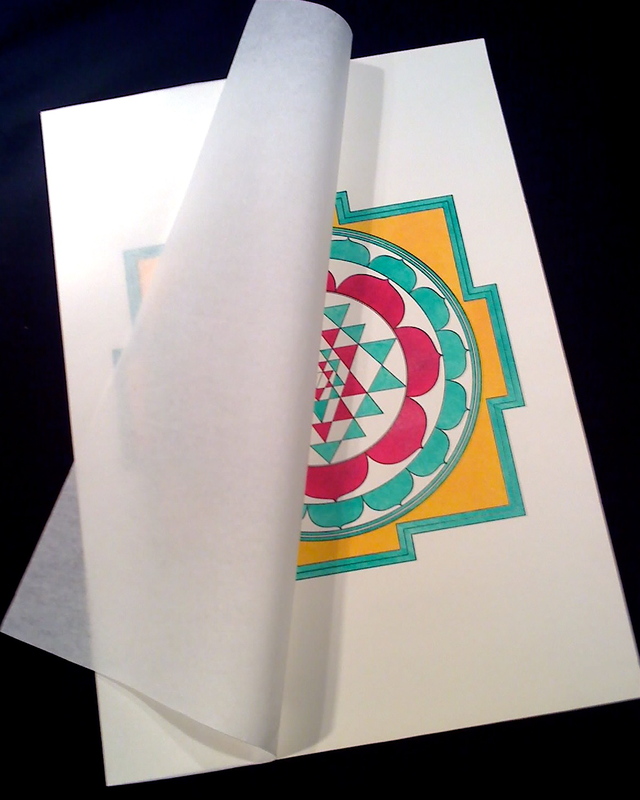 The smart and cool story of discovery of ancient mathematical algorithm, its perfection in two variations (easy 6-points of touch and more complex 10-points of touch) of Sri Yantra and nine, NINE /!!!!!!! 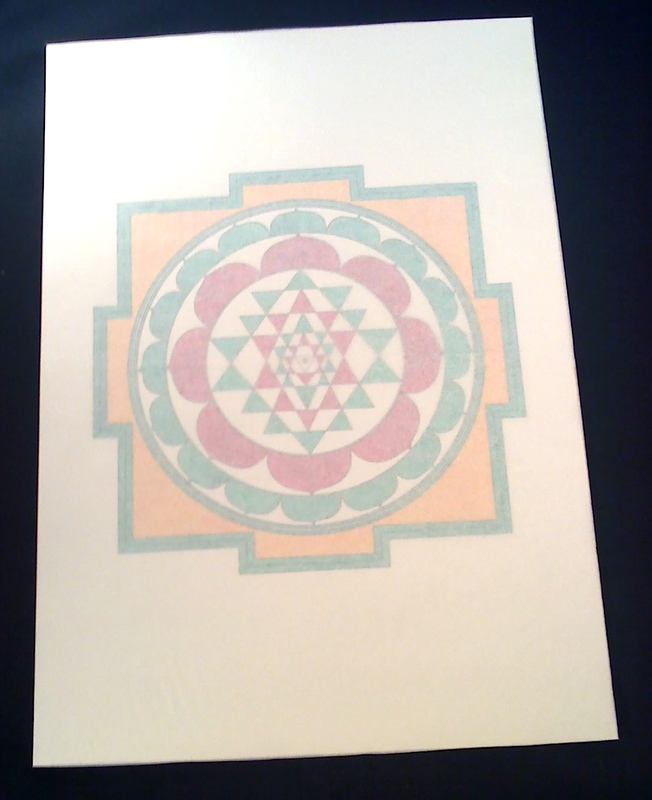 !/ variations of more difficult star polygons, Sri Sarvabhava Yantra (part of them at least) can be uploaded here sooner or later, I suppose. 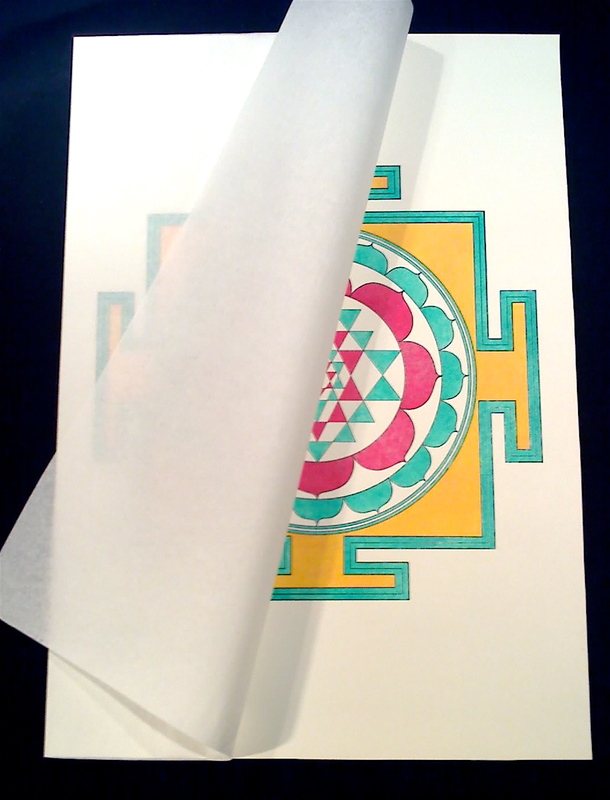 Sri Yantra #15 has a bit greater diameter, 4 1/4’’, and with mathematically exact straight lines it adds beauty to this kind of art. The outermost 14-pointed star polygon is drawn inside of thin and contrast thick circles. The outside diameter of Mekhala has four lines and they form two green strips and one white (in centre). Defence square contains four gates, three black line contour and full green edge. When you keep a sheet of paper horizontally and turn it a little, polygons seem to become like the mirrors and begin to reflect each other in strange organised order, it looks like a precious diamond game. Eighteen years of beauty. Nothing changed in this picture. Nothing changed in this world. It’s still beautiful for people to live and love in. The smart story of discovery of the ancient mathematical algorithm (with or without my bragging), its perfection in two variations (easy 6-points of touch and more complex 10-points of touch) of Sri Yantra and nine /!!!!! 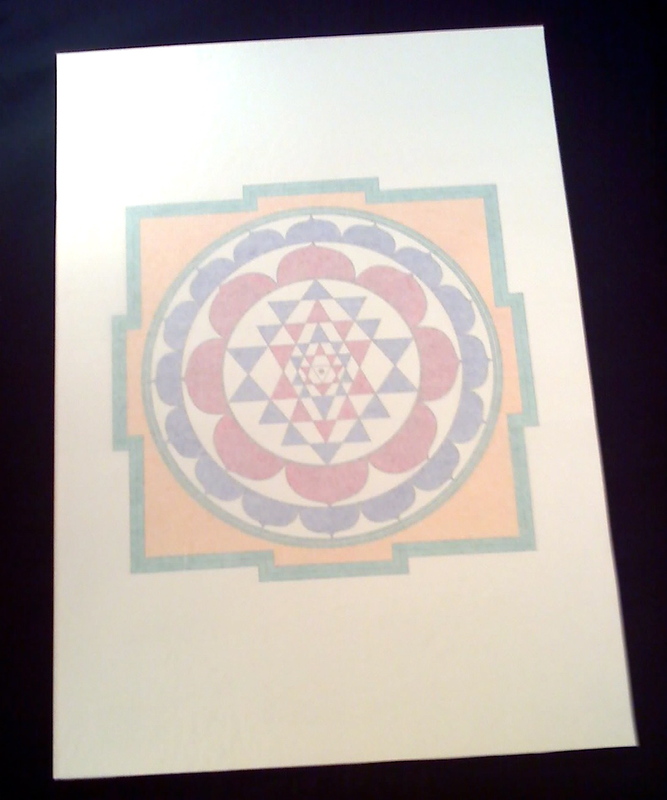 !/ variations of more difficult star polygons, Sri Sarvabhava Yantra (part of them) can be uploaded here soon, I guess. 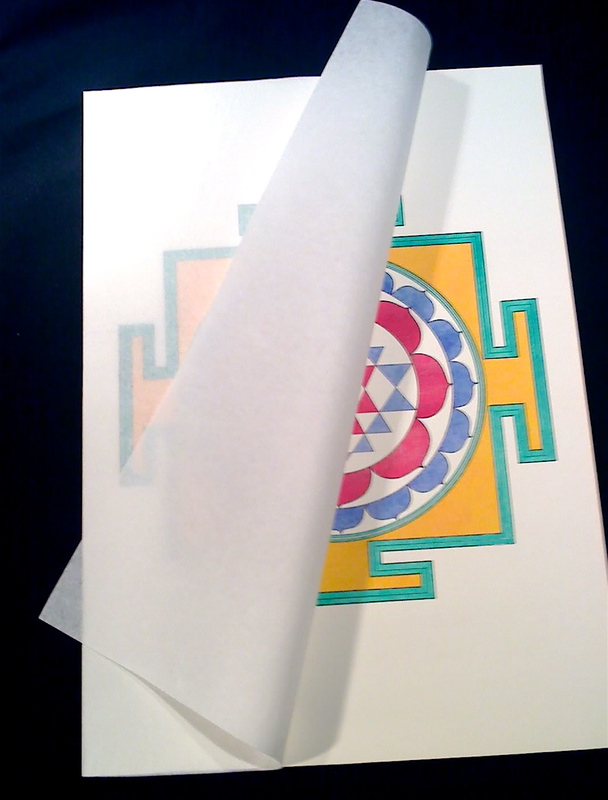 This is the last copy (Sri Yantra #10) with ten touches in the double thin and contrast thick circumference. Width of inner lines of polygons is 0.25 mm only. All eighteen points of three lines’ meetings have mathematically exact execution, that is why watching the stars is the splendid means for meditation. The form of Bhupura (defence square) is double svastika in three black lines. 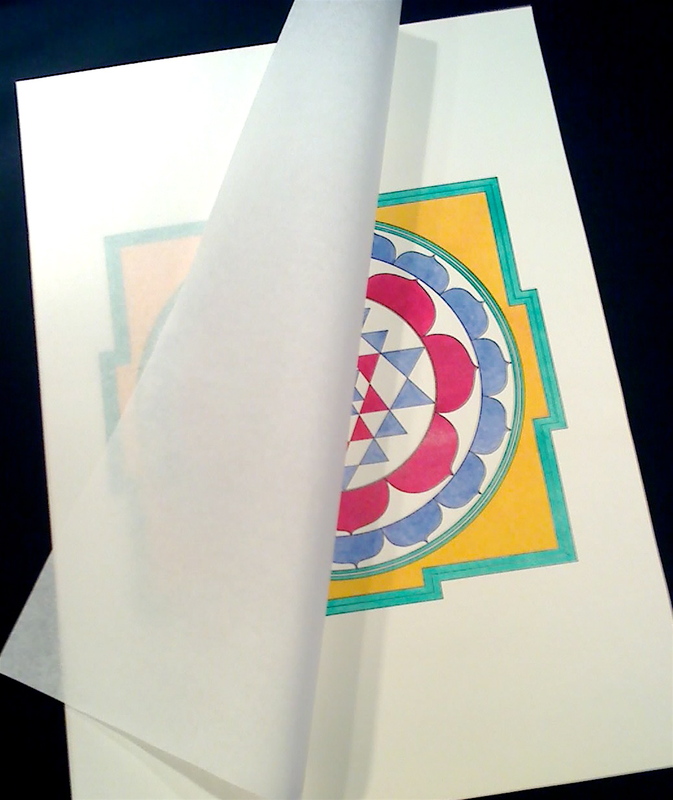 Special features of this copy are also its simplicity of double line for main chakras, and triple contour of mandala getting thinner when moving out, but three basic lines of the defence square gradually get larger in the same direction. The algorithm of its construction is still unpublished, and I hope will never be published, that IS and must be a secret path to special kind of knowledge. Just simple following them requires too much power, too much time and life, and the life will never be the same like it was in the beginning. Other cultures, other languages, no family, no friends, no leaving out a room, and to be face-to-face with every feature of itself. How often people are ready for this? 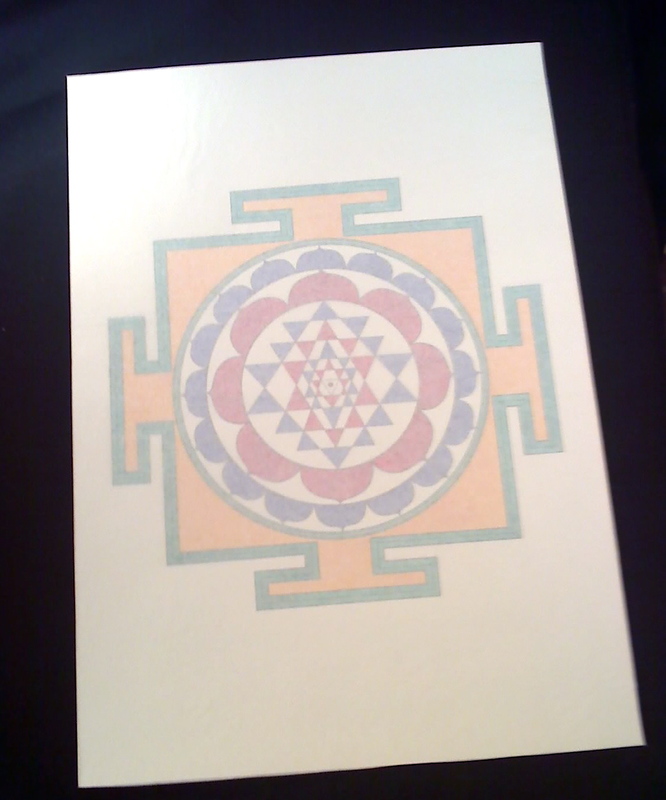 It is my pleasure now to show the result of my own journey and I really want Sri Yantra star polygons to travel around the world, they are worth it, they have beauty people never will have, because people are still mortal, and stars just aren’t (and never were). The story of discovery of the ancient mathematical algorithm and my bragging in small portions, its perfection in two variations (easy – 6 points of touch and more complex – 10 points of touch) of Sri Yantra and nine /!!!! 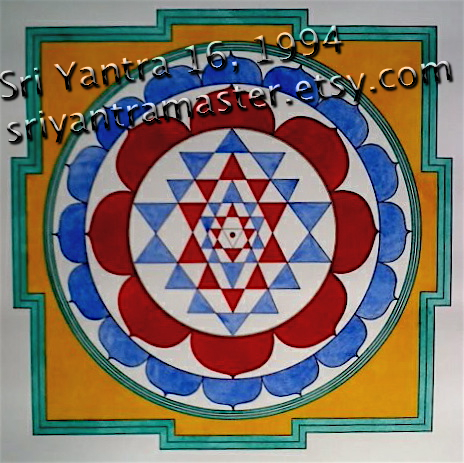 !/ variations of more difficult star polygons, Sri Sarvabhava Yantra (part of them at least)can be seen here, definitely this month or next. This is the one of the best stars in my collection, her lines in central kernel have width of only 1/4th of mm (0.25 mm), it was definitely a challenge, and there was a great joy when I achieved the goal. All places where three lines are crossing each other have mathematical solutions and beauty. I was so brave at that moment that I have put principal chakras into double circumference, thin (inner) and thick (outer, for contrast) one. This star has another notable feature — she is absolutely strong in mathematical gist. Sometimes I like complex Bhupura drawing (double svastika), sometimes I like to draw it simple (four gates by sides), and I think it’s a kind of eastern simpleness people can search the whole life, and not everyone can say in the end it has been found. Concentration during work can be so wonderful, I think the ink turns into blood, it’s shining when you work, it’s becoming firm and strong after, and it bears blood and breath of those happy days forever. Movements of drawing tools must be strong, gentle, soft and exact in the same time. It can make person happy. And made, at least one. 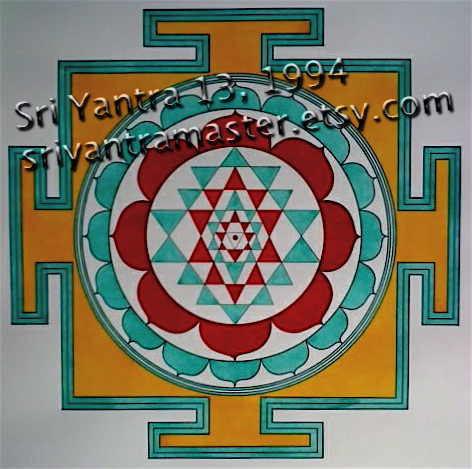 The story of discovery of the ancient mathematical algorithm and my bragging, its perfection in two variations (easy – 6 points of touch and more complex – 10 points of touch) of Sri Yantra and nine /!! 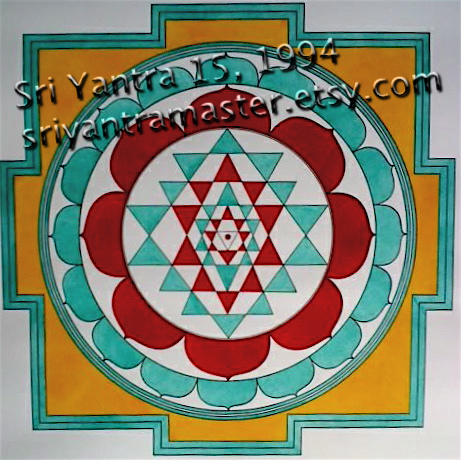 !/ variations of more difficult star polygons, Sri Sarvabhava Yantra (part of them at least) can be seen here this month, 2012. 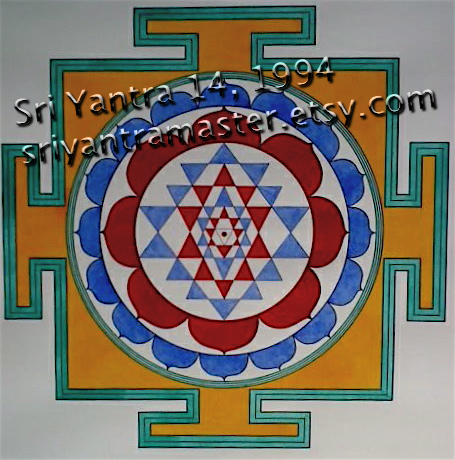 This is a twin sister of previous one, Sri Yantra # 04, the only difference is that it is of blue (more difficult colour to control by brush) colour. The lines of mandala and square of defence increase their width inside out from centre dot. 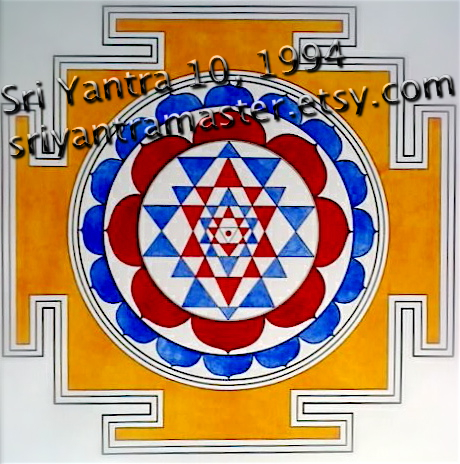 Every Sri Yantra star has 18 points of three lines’ interlacing, and they must be without empty space inside, that’s the key to mathematical design and old wisdom, and parallel and straight lines serve same goal too. Frankly, this item isn’t an item of sacred geometry art at all, it’s my life, my brain and heart, as is. I feel the beauty of stars now with the same passion as it was fifteen years ago. Quite a fact, a nice feeling to begin every new day of the year. In English I’d like to describe it with the word ‘bewitched’. 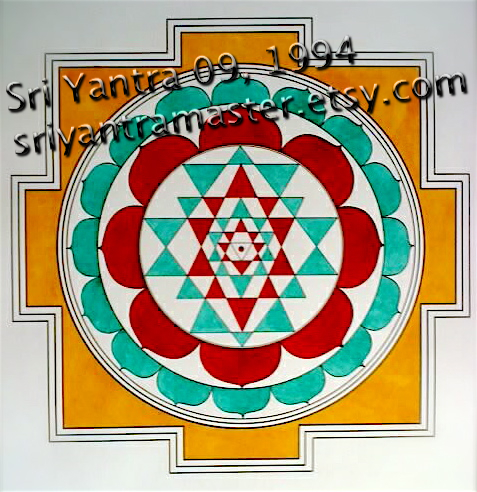 The story of discovery of the ancient mathematical algorithm, its perfection in two variations (easy – 6 points of touch and more complex – 10 points of touch) of Sri Yantra and nine /! 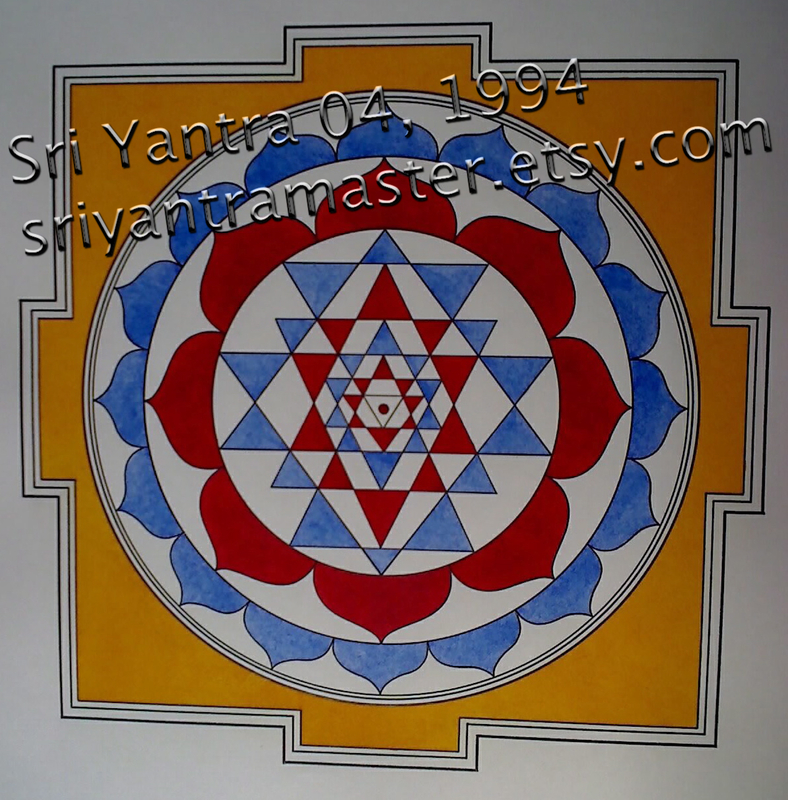 !/ variations of more difficult star polygons, Sri Sarvabhava Yantra (part of them at least) can be seen here very soon, in June 2012.